Ensemble Theatre present the World Premiere of THE RASPUTIN AFFAIR, by Kate Mulvany, at the Ensemble Theatre, Kirribilli. 1 April - 30 April. THE RASPUTIN AFFAIR is a new Australian play by Kate Mulvany. The play is concerned with the assassination, in December, 1916, of Rasputin, a Russian peasant, semi-literate monk and mystic, who exercised extraordinary power over the last of the ruling Romanoff family: Tsar Nicholas II and his wife Alexandra. Although this play is based on true people and events, some events and characters in this play have been fictionalised and should not be construed as truth. And, this is the case. Though, as a curious and avid reader of the strange historical enigma that Rasputin has become, Ms Mulvany's play, for me, is tantalisingly, more than less accurate in its detail. There is, however, some 'licence' taken with the appropriation of Russia's history and this particular story in the comic, farcical mode that the work is draped in. The production has some first class work, from the actors, Tom Budge (as Felix i.e. Prince Felix Yusupov), John Gaden, in very fine form (as Vlad, i.e. Vladimir Purishkevich - a right wing politician), Hamish Michael (as Dimitri i.e. Grand Duke Dimitri Pavlovich), Sean O'Shea (as Grigory Efimovich Rasputin) and Zindzi Okenyo (as Minya, a peasant servant and many other guises). Director, John Sheedy has the actors spinning in a helter skelter of comic offers in a very assured and complicated production. He has elicited from his Designer, Alicia Clements, a delicious and witty Set, staging the many entrances and exits and different locations with panache. The Costuming, too, is meticulous, whilst, the Lighting Design from Matthew Marshall is spectacular, accompanied with a very detailed and supportive Sound design from Neil McLean. All the elements of this handsome Ensemble production are, indeed, top of the rank. There is a problem, however, in that the comic tone of the work just does not seem to have found its right knell. With the tolling bells of the opening sound cues, and the reading of a dreadfully prophetic letter by the Monk Rasputin, to begin with, the audience are left not quite sure on how to 'read' the production that follows. It has all the intimations of a very interesting story but the playing of the actors seems to 'rocket' off, immediately, into a stratosphere of farcical exaggeration that the audience hasn't quite been prepared for, and so, not grasped and are, subsequently, unable to get aboard with them, no matter the excellent 'lunacy' of the said comic skills of the actors - in fact, that excellent lunacy, is, rather, I think, a bewildering barrier to entrance and comprehension. Just who are 'Fifi', Vlad and Dimitri, that we meet suddenly, and more than a little hysterically? And what an odd dialectical sound is coming from the tinted bespectacled servant - who is she? Is she who they say she is? In fact, with my audience, it is not until after the interval, when, presumably, they had conversed with each other about who was who and what was happening, that they were able to fully participate in the play. True, the play, also becomes more physically, nakedly comic, and in text becomes rather more contemporary in its vernacular. 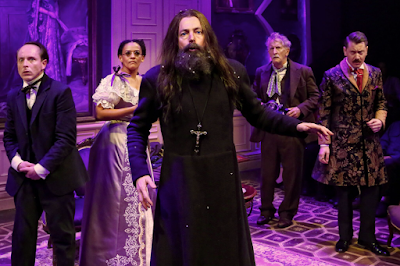 THE RASPUTIN AFFAIR is as brave an attempt at farce as is Declan Greene's THE HOMOSEXUALS OR FAGGOTS, over at the SBW Stables Theatre in Kings Cross, but its purpose in this mode of writing is rather, in comparison, opaque. Just what is the playwright, Ms Mulvany, saying with this wonderful cocktail of history and comic invention? What does this mayhem of history and comic flair give us to take away, other than a chase of 'entertainment', that does demand that you jump on board at a perilous speed of unprepared commitment? Is it that truth is stranger than fiction and that the facts of history can be really, truly farcical? For, the subject and content of this play are historically true: Rasputin was poisoned and shot many times, beaten and thrown, trussed, in a rug, off the Petrovsky bridge, and, yet, on autopsy, it was drowning that was found to be his cause of death. The prophetic letter read as prologue and epilogue to the action of this play does, also, actually exist! If the facts of history can be fraught with farce, and that is the statement/point of this play, it might help to let us know with a little more clarity somewhere in one of the character's speeches - for at the moment one leaves the theatre as to wondering why and wherefore have the Artists expended so much effort for such little point. In this it is found wanting, unlike Mr Greene's farce, that has a verbal wallop (startingly political) in the sting of its tail. This production of Ms Mulvany's play has a similar raucousness as the 1978 Boney M pop song: RASPUTIN. And so they shot him 'til he was dead. RASPUTIN; Rascal Master, by Jane Oakley. 1989. Labyrinth Publishing S.A. Switzerland. RASPUTIN: The Last Word, by Edvard Radzinsky. 2000. Translated from the Russian by Judson Rosengrant. Allen & Unwin Australia. THE ROMANOVS: 1613-1918, by Simon Sebag Montefiore. 2016. Weidenfeld & Nicholson. RASPUTIN, by Douglas Smith. 2016. Pan MacMillan. One of those who cooked for Rasputin during the Great War was a chef at Petrograd's luxurious Astoria Hotel who went on, after the revolution, to cook for Lenin and Stalin. He was Spiridon Putin, grandfather of President Vladimir Putin. 'History repeats itself: the first time as tragedy, the second time as farce' - Karl Marx. Another excellent book is Killing Rasputin by Australian medical scientist Margarita Nelipa. Margarita is of Russian background and speaks the language fluently this has allowed her to research original documents etc in Russia.Highly recommended.